- thanks for reviewing it, and thanks for not sharing this link with anyone! Thanksgiving Dinner Doesn't Have to be Hard! I told a friend I was writing out Easy Thanksgiving Dinner Ideas, her response was that the easiest idea would be for me to make the dinner and bring the food to her house. While I can’t do that for her or for the followers of this site, I can do the next best thing. 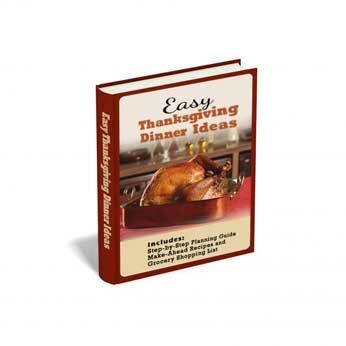 I have written up step by step directions and easy recipes to help you make a great Thanksgiving dinner yourself. If you use this site, you know that I’m a midwestern Mom who cooks all the time for my family and friends. I’ve included in this guide the recipes I make for my own family along with tips I often share with my friends when they call in a panic the night before Thanksgiving. To keep it real, I even share one of my own mishaps to let you know that things can go awry, but with a little planning you can pull off an amazingly easy and amazingly tasty holiday dinner. Easy and delicious recipes, including a No-Lump Make-Ahead Turkey Gravy Recipe! I have condensed all of the information into a 25 page guide which includes photos of many of the recipes. I am offering for sale for $3.99. You can find some of the recipes on my site for free but this guide provides more than recipes, it gives you a plan that breaks down all the activities you need to do in the weeks coming up to Thanksgiving.